This photo made me giggle. Yes, a sign usually reserved for construction sites is on bread. Many people have started following a gluten-free diet because they find that they can't tolerate gluten or are allergic to it. Also, some bread tastes a bit like concrete so this sign clearly makes sense. In case you didn't know, gluten is a protein found in wheat, barley, rye, kamut, and spelt. Gluten is also a food additive and can be hidden under the names "maltodextrine" and "dextrine". Why are so many people choosing gluten free? I think that people feel better when they don't eat the many processed foods that use gluten. Think about it. Start your day without toast or a donut, then don't eat a sandwich for lunch, and then skip the pizza for dinner. So, what did you eat? 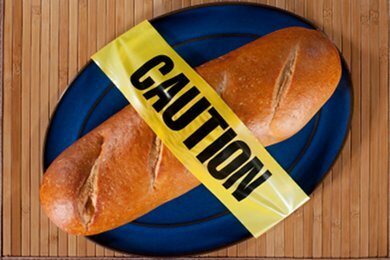 You probably made much better choices by going gluten-free. Maybe you had my yogurt, walnut, and maple syrup breakfast, a salad for lunch, and a lovely stew with carrots, potatoes, and peas for dinner. Hey, what about your snacks? I have chosen 10 of the most popular gluten free options on Snack Girl. Have you tried going gluten-free? Please share. Top it with a mixture of salsa and black beans. Top with sweet corn tossed in a little ground cumin. I added lots of barely cooked spinach before serving. p.s.Lisa - we met on Thursday at Betsey's - I'm the one with the British accent! Sourdough is a traditional way of preparing grains that many people with gluten intolerances can handle. It tastes delicious and is fun to make. It's time for sourdough to make a comeback. Yay for the gluten awareness.... my daughter has Celiac and can't have any at all. FYI - in the US, maltodextrin is considered safe, as it's derived from corn. I think what you meant to say is anything with MALT has wheat gluten. That's pretty much guaranteed. You may be interested to know that while the casual person who cuts a lot of gluten out of his diet loses weight, people who look for substitutes (GF cookies or pasta, for example) tend not to or to put ON weight. A lot of GF food has extra fat & sugar to cover up the strong and sometimes unpleasant flavors of alternate flours. Bottom line is that it's best to go with a diet that's naturally gluten free - you can have all fruits and veggies, all meat and dairy, rice, and potato. My question is, what is the benefit of a gluten free diet is one does not have Celiac's? I've always thought that gluten-free diet were just another fad. (For someone who is NOT gluten-sensitive, of course.) However, you've made a great point here: "Think about it. Start your day without toast or a donut, then don't eat a sandwich for lunch, and then skip the pizza for dinner. So, what did you eat?" Stephanie G, even if you don't have Celiac's, gluten is hard on your digestive system to process. It can cause gut issues that until you remove it from your diet, you don't realize you had because you have gotten so used to it. If you don't have Celiac's it is just kinda one of those everyday healthy lifestyle type choices you can make throughout the day to make smarter choices. Not that you can never eat it again, but by modifying and being conscious of it you will begin to notice a lighter feeling in your gut. My son has gut issues and has to be on probiotics daily, we have found that his poops are not so bad when he has a more gluten-free diet for a few days. Thank you for the post. I shared on facebook,twitter and I pinned it. I'm not consciously following a gluten-free diet, but I find that I don't eat alot of bread anymore because it's high in WW points. I have noticed that it seems that saying something is "gluten-free" is the new buzzword for advertising food. It's everywhere now. I'm reminded of the 'fat-free' craze that is still going on. It seems the same thing is happening though, that more sugar is being added to those foods to compensate for flavor. I don't buy too many things that are lowfat for that reason. I don't plan on buying something just because it says "gluten-free" on the label for that same reason. I think eating whole foods and not worrying about fat-free or gluten-free is the way to go (unless there's a medical condition of course). Buying something that should have gluten or fat but is being processed to not have it seems silly to me. "My son has gut issues and has to be on probiotics daily, we have found that his poops are not so bad when he has a more gluten-free diet for a few days." I too had "gut issues". I went gluten free, took a caprylic acid supplement for about a month (also I now use coconut oil for most of my cooking which contains caprylic acid) and took probiotics. One thing I recently learned is that probiotic supplements don't make it past the uppermost part of your intestine. But when you get you probiotics from food (such as yogurt, kefir, and any fermented food like sauerkraut), they permeate through the entire intestinal tract. I have noticed a great improvement in my digestion since I started drinking a few ounces of kefir every day a few weeks ago. I have even been able to eat the occasional non-gf foods recently without any negative consequences. Gluten free living may be a fad for some, but for many it's necessary (Celiac Disease)or simply best for their optimum health and overall wellness.